As of this morning, or possibly this lunchtime, I have finished the Christmas knitting that is required for Monday when we see one half of the family. Yippee! .. and that’s it. Totally do-able. I hope! I had started these a little while ago, and finished incarnation one of mitten one last night when I needed the DPNs for something else. The original version had caused the yarn to pool really badly so I was knitting alternate rounds from each end of the ball to break it up. Incidentally that technique could win prizes for things most likely to break the knitter. Only when I was finished did I realise that it was missing a pattern repeat on the width and was going to be too small. Ribbit, ribbit, ribbit. Happily as you see, the proper pattern gives not unpleasant swirls, and knit up in no time. 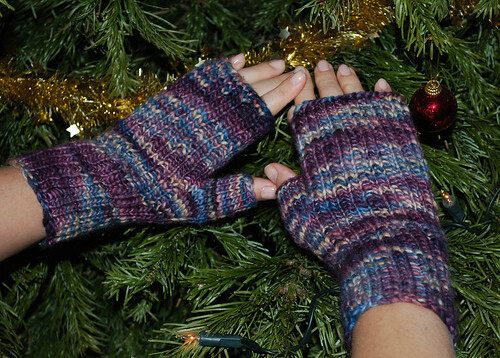 The patterns is the Maine Morning Mitts from Clara Parkes‘ Knitters Book of Yarn and the yarn is Manos del Uruguay Classic Wool. I think the colour might be 7306 but I’ve no idea where I put the ball band. It came from K1 in Edinburgh though – Lulla choose it having admired and hankered after H’s mittens so now she has some too. They will match her coat and hat very nicely as purple is rather her colour. Just wait until she sees her socks! 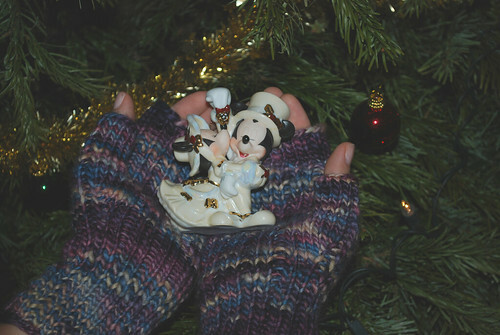 PS – Mickey and Minnie are this year’s holiday Christmas Decoration to add to the tree; it’s a china ornament and rather cute, if a little heavy. We’re just impressed that we got it home intact.